The folks at Lava Magazine recently spent some quality time with an Andean. Read below to find out what Jay Prasuhn thought about our superbike! 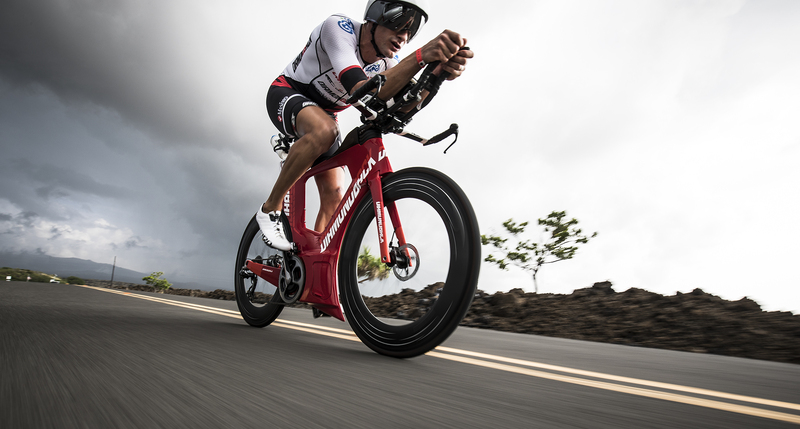 There’s no question: we’re in a dynamic time for tri bike development. Finally, some brands are saying forget it. Forget UCI standards. Forget even general triathlon standards. Goodbye rulebook. And the results are polarizing. One of the first bike brands to cross the line in the sand and create a bike that is an affront to the current standards? Diamondback. Yep, a brand with marginal triathlon history stepped forward last year and made it known that they want to deliver to triathletes an unconventional bike with real data, real utility and real speed. We finally got to ride this bucking bronco, and we can attest that those three boxes are checked. The Andean is a world-beater. And Diamondback is a true triathlon brand. We were lucky enough to get to see the development of the Andean. We flew to Toronto two years ago and, under secrecy, watched as it was developed with renowned engineer Kevin Quan of KQ Studios (who was contracted by Diamondback to make the creation happen) and as a quarterscale model of the bike was tested at the University of Toronto wind tunnel. It was quickly apparent to us that Diamondback was making a true commitment to triathlon with a bike that was going to shake the industry. The insane down tube cowling that fairs the front wheel looks like a Ducati race motorcycle. There are no seat stays. There are disc brakes. There are wild frame storage options. And there was tunnel data to prove it’s fast as hell (a hot knife at 0 degrees, and 10 percent less drag than its own Serios model at 15 degrees of yaw). It was a promise to answer a triathlete’s wants. For authenticity, we went through the typical consumer process, and we found that the bike is truly made to order. While on a trip at Challenge Roth, I went to Diamondback’s custom studio and placed an order for what I would buy were I spending, inputting my fit parameters to get my sizing. My total? $6,540, race ready. Not unreasonable. It can be built to be as dear as $10,000 (with Shimano Di2, a Hed rear disc and an SRM power meter, and including the optional $290 custom travel bag,) or down to a base price of $4,780 with a Shimano Ultegra Di2 group, Hed Ardennes wheels and Profile Design aerobars (and using the still well-designed cardboard box the bike ships to you in). Drink that in: $4,780 for one of the most aerodynamic superbikes out there, with disc brakes, aero acumen and full practical functionality. These reasonable prices are thanks to Diamondback’s decision to offer the Andean (and a few other models, including the Serios) direct to consumers. My made-to-order model was assembled at Diamondback’s HQ in Kent, Washington, and shipped. I arrived home to a bike box; the Andean was here. It took less than 30 minutes for me to unbox and build the bike. I was ready to test. Diamondback had a key philosophy when it launched the Andean: provide triathletes with a practical bike with heaps of storage and uncommon aero characteristics. As such, it has option for multiple food storage locations at the top tube and between the aerobars. Same for hydration, with two sets of frame bosses. Finally, there’s a behind-the-seat-tube storage cavity, and a massive down tube cowling (we stashed a flat kit, two spare tubes and a light rain vest) held shut by a magnetic door. Everything is cleanly integrated. If you don’t need all of it, there are clean, modular replacements for everything. Loaded for our 3.5-hour test ride, there was ample space for everything. The first question about the ride? “Doesn’t all that surface area knock you around in the wind?” In short, no. There is a lot more surface area than a traditional tri bike, but because the frame is not on a pivot point and the rider’s weight serves as a stabilizer, it’s no worse in crosswinds than your current tri bike. In our estimation, the depth of the front wheel has significantly greater bearing on battling crosswinds, since it’s the middle of a pivot point: the fork steerer. We took the Andean on two very different rides: a relatively flat coast ride (along the Ironman 70.3 Oceanside course on Camp Pendleton) and a hilly inland loop. On both, the Andean shone. As we expected, the Andean is a scythe once it’s wound up on flat, straight roads. Hats off to Diamondback. It takes guts for any brand to invest this heavily on a bike this wild. Finally, getting miles on it, it’s great to see it delivers on its promises. The Andean stashed my pretzels and had the space to carry all the drinks I needed on a hot 90-degree day, all at a great price for a true superbike.